The event will begin at 6:30 p.m. on Thursday at the Crowne Plaza Hotel in Suffern, which is the lead sponsor of the event. Tickets to attend cost $99 each. The funds raised from the event support not only JCC operations, but also will bolster its youth sports programs and will provide future financial assistance for a variety of JCC programs. Some of those are its new early childhood program, day camp and after school programs. Watch Boomer Esiason speaking at a CBS round table discussion Dec. 2014. Boomer Esiason is best remembered as quarterback of the Cincinnati Bengals and New York Jets. Boomer Esiason was named to four Pro Bowl games (1986, 1988, 1989, 1993) and holds several NFL career records for left-handed quarterbacks, including most touchdown passes (247), passing yards (37,920), and completions (2,969). Esiason also led the AFC in passing in both 1988 and 1989. 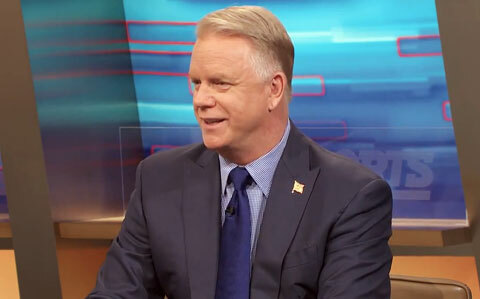 Among the awards Boomer Esiason has earned during his career include the NFL Most Valuable Player Award in 1988 (leading the league with a quarterback rating of 97.4), and the Walter Payton Man of the Year Award in 1995 for his charitable work. At his retirement in 1997 Esiason finished in the top 10 all time of many QB career statistical categories. He currently serves as a NFL analyst for CBS Sports. Playing Field Promotions is a booking agent for motivational sports speakers and celebrities. If you would like to book Boomer Esiason for a speaking engagement or personal appearance, contact Boomer Esiason’s booking agent for appearance & speaker fees at 1.800.966.1380.